We love lamb in our house- it’s meltingly tender and just darn delicious. But this year, we’ve noticed a marked increase in the price so our lamb consumption has dropped and it was being eaten less and less. However, a few months back (yes, I’m a tardy blogger) we attended Open Farm Sunday at our favourite farm shop, Red Bank in Newton le Willows. Primarily a butchers, all of the meat comes from the farm and Nicola and her band of lady butchers are brilliant. Anyway, in the chiller they had lamb breast. It was lamb, but cheap. We’d never had it, but we’re now total converts. A piece of breast to serve two (which in reality would serve three or even four if we weren’t so greedy and served with more sides) is under £4. It’s not a pretty cut and there is lots of fat so it requires cooking slow and low and a bit of fiddling once it’s cooked. My favourite way with lamb breast is really simple in a casserole. Place it on a bed of roughly chopped onions and whole garlic cloves (don’t panic about the garlic, it melts into the gravy during cooking). Add a small bottle of red wine (those single serve ones in the supermarkets) and about half a litre of veal stock. Veal stock? Sounds odd doesn’t it but I am a convert since Essential Cuisine sent me some. It’s not as over-powering as beef stock and chicken or veg just wouldn’t work. Bung it in the oven on about 130c for as long as you can stand – three hours is my minimum target time. 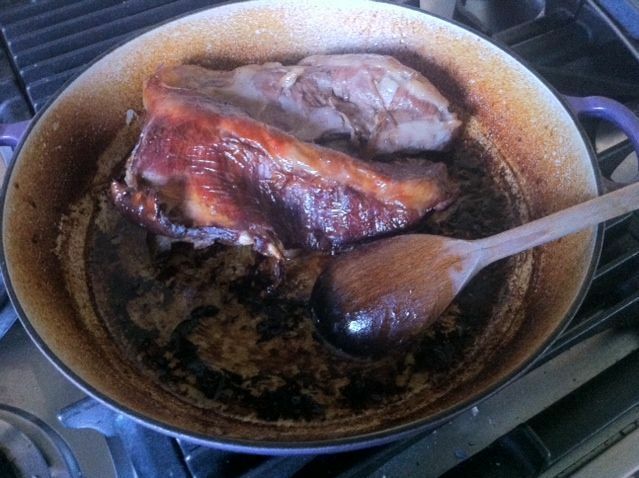 Keep an eye on it every hour – baste with the gravy which is forming in the bottom and you may have to top up the stock if it is drying up. After three hours, you are left with an amazing gravy and super tender lamb. You will need to take the lamb out, separate the meat from the fat and then return the meat to the pan where it can stay moist and warm in the gravy. A very poor photo, even by my standards. This does not do justice to the dish! We have it with a giant pile of roast carrots, parsnips and spuds- and a lie-down afterwards! I’m just back from Crete where we had amazing lamb cooked in rose wine (finally, a use for the evil stuff) and bay leaves. Next lamb breast we have is getting this treatment- I can’t wait!